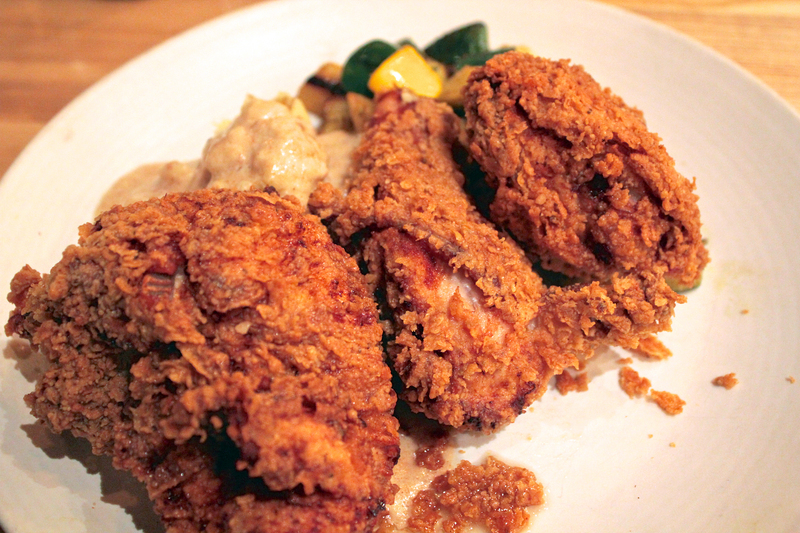 A classic American comfort food, fried chicken is a delectable guilty pleasure. Traditional Southern fried chicken is typically marinated in buttermilk, then dredged in flour and deep-fried. However, from batter and frying methods to secret spice blends, chefs tend to lend their own interpretations to the dish. Furthermore, fried chicken can be served as a savory dish or paired alongside fluffy waffles for a sweet spin. Here is a collection of 10 South Bay restaurants serving up unique versions of Southern fried chicken. 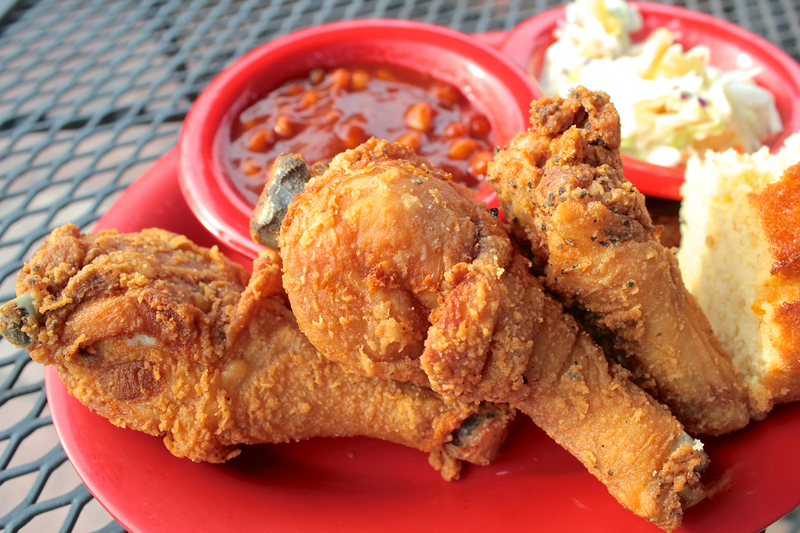 If we missed your favorite fried chicken spot, please be sure to share it in the comments. A New Orleans theme complete with Mardi Gras beads and hurricane cocktails make Nola a popular party destination in Palo Alto. The restaurant serves classic dishes of Creole and Cajun cuisine such as jambalaya, étouffée and gumbo. A mashup of sweet and savory, the fried chicken is free-range boneless chicken that is dipped in buttermilk, coated in cornflakes and served with chicken-thyme gravy, waffles, whipped cranberry butter and organic maple syrup. A popular venue for live music in downtown San Jose, Cafe Stritch serves a menu of American comfort food including buttermilk fried chicken with waffles. Large pieces of leg and thigh meat are dipped in a batter that gives the fried chicken a delicious thick and flaky crust. 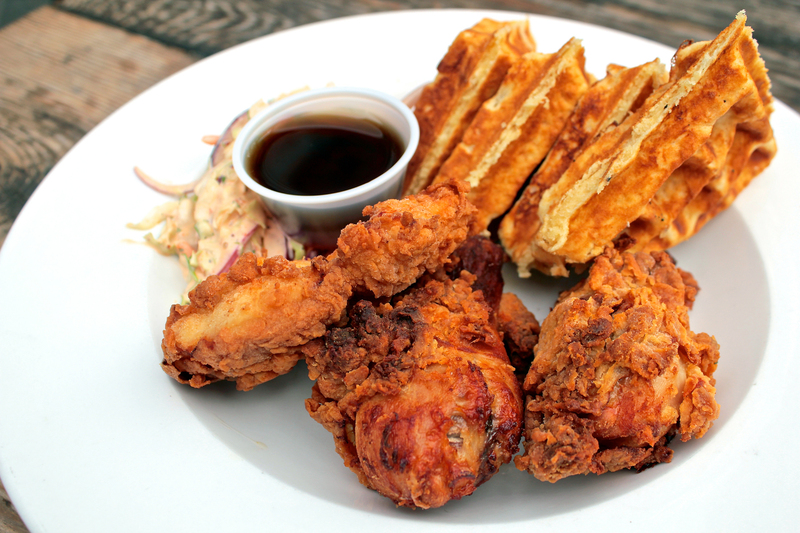 The chicken is served alongside fluffy Belgian waffles and a spicy coleslaw. 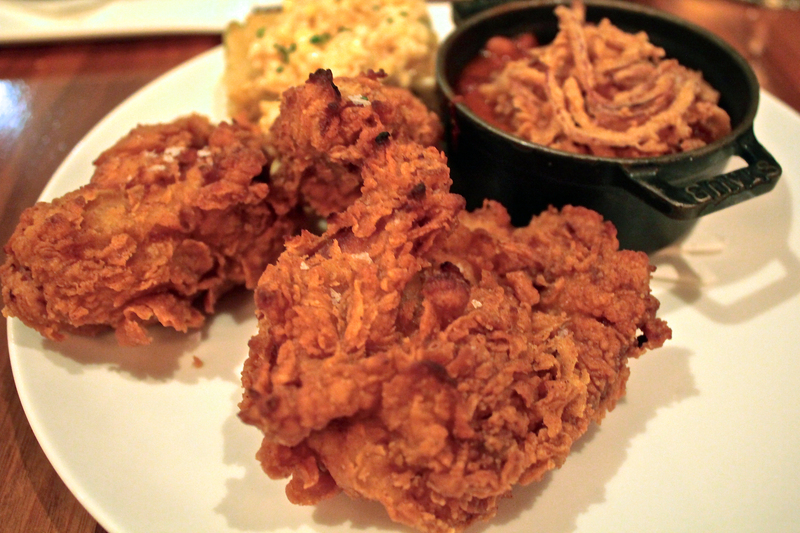 Cafe Stritch only serves their popular fried chicken dish on Friday and Saturday. While this Los Gatos restaurant may be bustling with guests enjoying wood-fired pizzas and craft cocktails, Oak & Rye also features a popular fried chicken dish on their brunch menu. 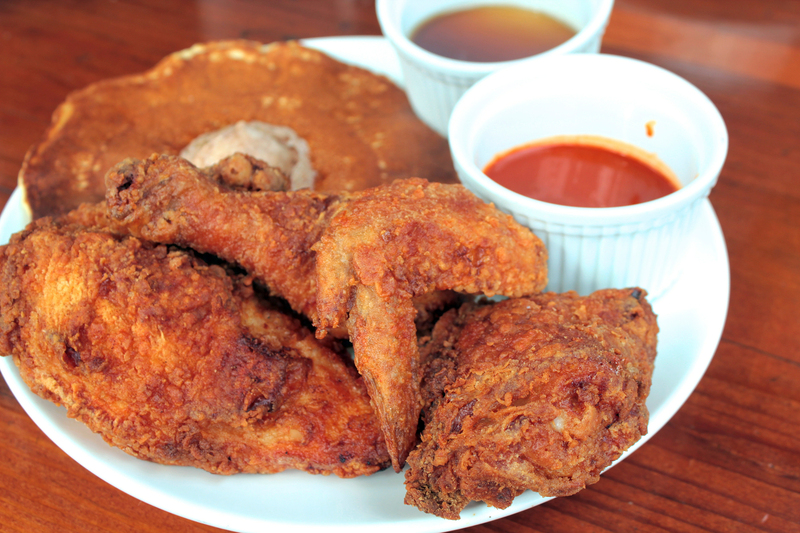 The crispy fried chicken is plated alongside a pancake with cinnamon butter and served with maple syrup and a Louisiana style hot sauce. 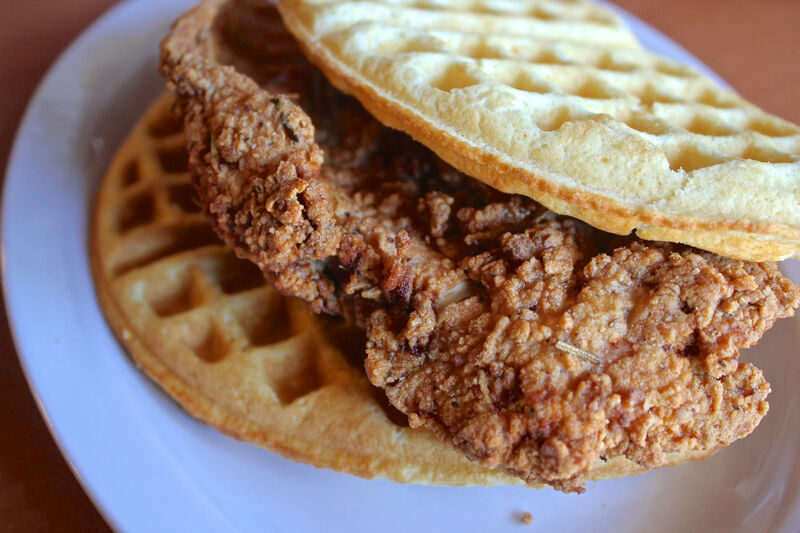 Located walking distance from Levi’s Stadium in Santa Clara, Butter & Zeus features a menu of waffle sandwiches, both sweet and savory. The popular Chicken ‘N Waffle features a boneless, skinless breast fried with a rosemary batter and sandwiched between two warm waffles. 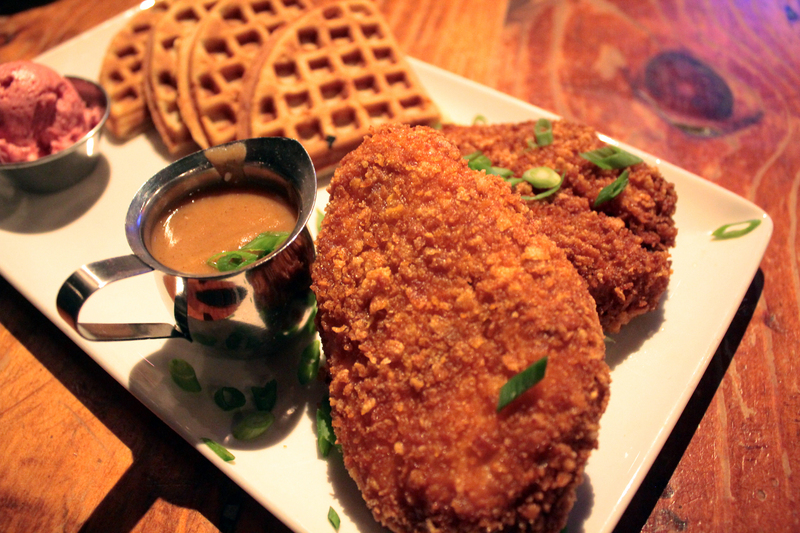 Butter & Zeus also serves their fried chicken alongside a churro waffle that has been coated in cinnamon sugar. The Table serves contemporary American cuisine prepared with locally-sourced ingredients in a homey setting. A recent renovation added a full bar and patio space to this popular Willow Glen restaurant. 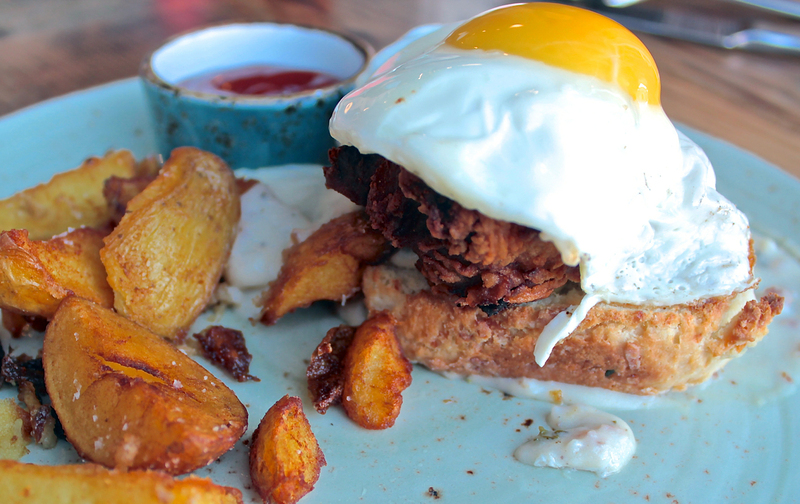 Fried chicken is featured on The Table’s brunch menu and is served atop a cheddar biscuit covered with country sausage gravy and a fried egg. A side of crispy potato wedges completes this rich dish. This American gastropub is inside a historic building which once served as an agricultural depot for San Jose ranchers during the turn of the century. The Farmers Union features a massive bar set in the center of the brick building and serves modern American cuisine. The classic fried chicken is served with pan-roasted squash and buttermilk mashed potatoes. A rich and flavorful housemade bacon gravy elevates the dish to a higher level of American comfort food. Scratch serves modern American cuisine in a cozy, refined setting. The fried chicken at Scratch is an edible ode to American comfort food on a single plate: tender pieces of chicken in an extraordinarily crispy batter served alongside a moist cornbread cake and Boston baked beans presented in a cast iron cocotte. 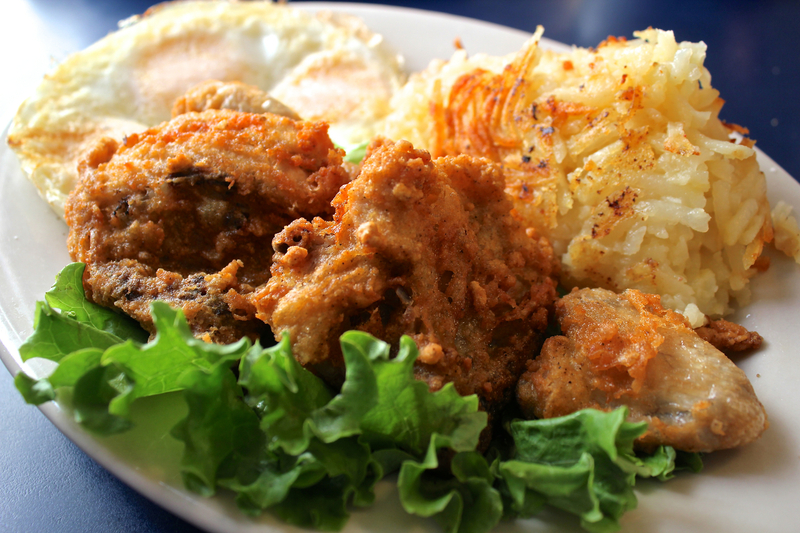 Southern Kitchen Coffee Shop is a no-frills breakfast joint in South San Jose that serves ample portions of American comfort food and Mexican breakfast dishes. The fried chicken with eggs is served alongside breakfast potatoes, two eggs and toast but can also be purchased a la carte. One of the few restaurants in the South Bay for soul food, Lillie Maes has two locations side by side. 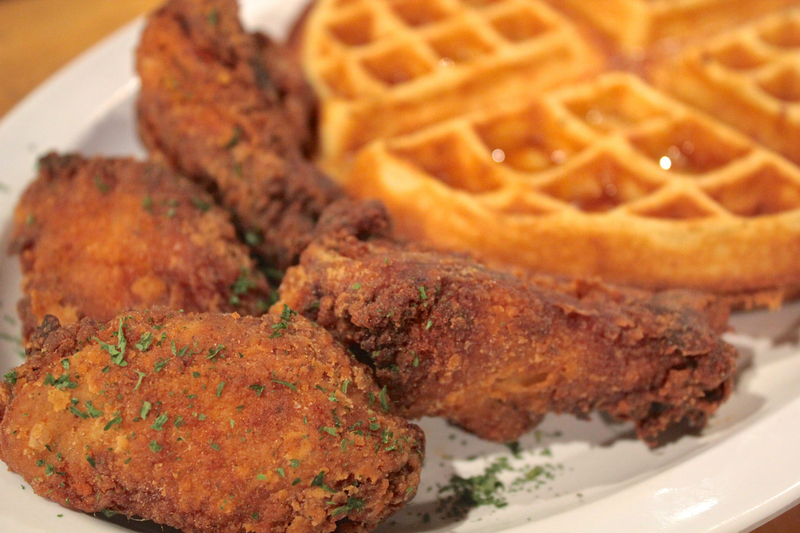 Next door to the original House of Soul Food is Lillie Maes House of Chicken and Wafflez. The restaurant serves Southern-style fried chicken with cornbread and baked beans as well as fried chicken and waffles made with a special family blend of spices. Serving a menu of classic Cajun dishes Louisiana Bistro aims to bring the food and music of New Orleans to San Jose. The bistro serves po’ boys, gumbo and jambalaya accompanied by live music on Friday nights. 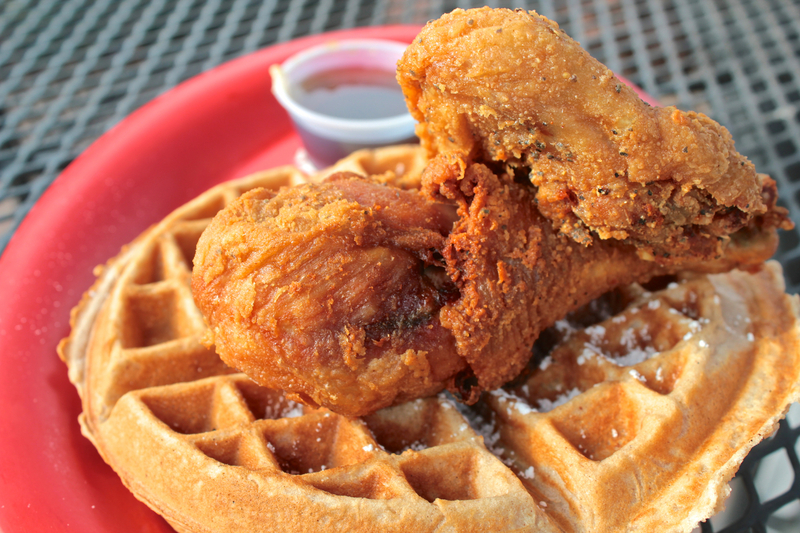 The chicken and waffle plate showcases their specialty in preparing Southern comfort food. Leg and thigh meat are first tossed in a special blend of Southern spices before being deep fried and served alongside fluffy buttermilk waffles and maple syrup.